Unveiled today at the New Music Seminar in New York City, the Ultimate Chart aims to update ancient methods still used to track the popularity of songs and artists. 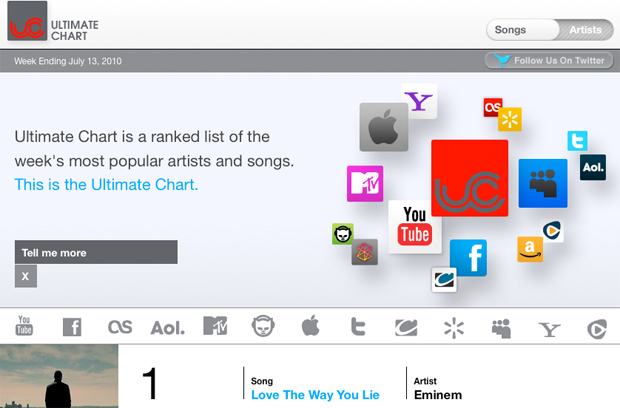 Rather than basing rankings primarily on, for example, physical album and single sales, the Ultimate Chart uses everything from Amazon downloads and Vevo views to Facebook fans and Twitter followers to provide the music industry a chart for the digital age. The Ultimate Chart bases its metrics on: traditional and digital sales and airplay; online audio and video; subscriptions; on demand services; program streams; and social media metrics — the first tracking system to combine those elements into a single measure. “If there is some connection you are making between you and an audience, we want to measure it,” Garland explained today at NMS. Last night, Big Champagne launched its first chart, the Hot 100 songs, which basically mirrors Soundscan with many of the familiar big names (Lady Gaga, Justin Bieber, etc.). But Big Champagne isn’t stopping there. At Tuesday’s announcement, Garland said the Ultimate Chart will also include measures of indie and unsigned artists, which Garland believes will help musicians climb out of obscurity. “We want to measure the unmeasurable, chart the unchartable,” he said. Garland also mentioned Tuesday that it may include measurements of illegal downloads in the chart as well, though in a follow-up call the company said it had no plans yet to include that file sharing data in the Ultimate Chart itself. Rather, Big Champagne will focus on legitimate parts of the industry, and chart illegal downloads separately through a service called TopSwaps. Either way, these new data symbolize how traditional Soundscan metrics are no longer as relevant. Interestingly, the Ultimate Chart has weighted its metrics based on revenue and perceived value, meaning traditional and digital single sales will create more movement up the charts for artists than, for example, Facebook impressions. And Garland hopes to create even more metrics like merchandise and ticket sales and has already partnered with We Are Hunted to measure who is creating the most music chatter in the blogosphere. Certainly the Ultimate Chart will shake up an industry known for slowly transitioning into the digital age. Soundscan, for example, has been published in various forms since the early 1940s. And the Foggy Mountain Boys just don’t move units like they used to.